Today’s preview is brought to you by the co-founders of Super Awesome Games and co-designers of Vs. System® 2PCG®; Danny Mandel and Ben Cichoski. Earlier today, Upper Deck announced an expansion to their Vs. System® 2PCG® organized play. A part of this expansion will include new Featured Formats during the main events. On October 1st 2018 the Vs. System 2PCG will introduce its first Featured Format. What is a Featured Format? A Featured Format is a set of special rules that affect the game for a three-month period. For example, one Featured Format might say you can only build a deck using cards from specific expansions. Another Featured Format might only allow cards from specific teams. And a third type of Featured Format might require you to choose from a restricted selection of Main Characters. Tournaments sanctioned by Upper Deck will use the Current Featured Format. We also encourage local stores running tournaments as well as folks playing at home to try out the current Featured Format. The first Featured Format is Big Apple Battle (more on this below) and it takes place in the Fall Season: from October 1st through December 31st 2018. When that format ends, the next one immediately begins and runs through the Winter Season: from January 1st through March 31st 2019. And so on, such that there will be four Featured Formats every year. One of the Vs. System 2PCG’s best qualities is its theme. We try very hard to make these characters feel like their comic book, movie, and TV counterparts. While it can be really crazy to mix superheroes of all types with xenomorphs, predators, and vampires, sometimes it’s fun to keep things simple and focus on a specific universe or type of battle. As the Multiverse grows and the total available cards in it gets larger and larger it becomes harder for new cards to have an impact. This can lead to stagnation, where the most powerful decks remain at the top of the game. A simple way to think about it is this: if there are 100 different cards to choose from and we add 100 more, we’ve now doubled the size of the card pool. But if there are 1,000 different cards to choose from and we add 100, we’ve only added 10% to the card pool. Some games address the stagnation problem by “rotating out” older expansions, which (eventually) removes the most powerful decks from the environment. 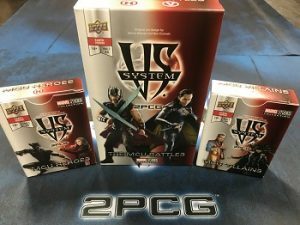 However, with the Vs. System 2PCG we don’t ever want older cards to become obsolete. Featured Formats allow us to temporarily remove cards from the environment in a variety of different ways like highlighting certain main characters, certain teams, or certain universes. And since a Featured Format only lasts for three months, if players feel that a Format has grown stale or has been “solved”, there’s a new Format right around the corner. It’s always great to add new players to a card game, but there are two main barriers to entry: cost and complexity. As the number of expansions grows so does the monetary price for a new player to catch up. Similarly, the more cards in the pool there are, the more daunting it is for a new player to learn the cards and build a deck. By temporarily altering the card pools, Featured Formats make it easier on a new player’s wallet and brain. They can also act as a guide on how to get into the game, directing a new player toward specific sets, teams, etc. Many Featured Formats will highlight cards from the most recent Arc. For example, Big Apple Battle includes the Spider-Friends, Sinister Syndicate, and New Defenders expansions. On the other hand, there are tons of older cards that never got a chance to shine in the Multiverse, but will have another opportunity in the new context of a Featured Format. When certain Featured Formats end up being popular, we can bring them back. And if a Featured Format ends up being unpopular we can retire it (and try to learn from it). Ultimately the purpose of a Featured Format is to give you more ways to play with your cards which is just plain fun. It’s time for street-level heroes to take center stage in a battle for New York City. Your deck can include cards from more than one of the above teams. You can have any number of neutral (no affiliation) cards in your deck. There are neutral cards available in other expansions. These are legal for this Format. What happens when Cinema’s Mightiest Heroes visit Sunnydale? Rules: You must use a Photographic Universe deck. One of the main reasons Vs. System was reintroduced under the 2PCG model was to focus on deckbuilding. Give the same product to every player and see what each would come up with. 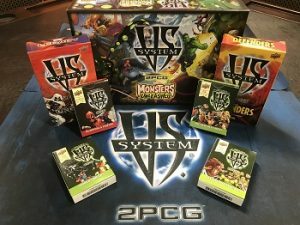 With the recent announcement of the expansion in Vs. System 2PCG organized play events it gives us a chance to bring that idea forward. Let’s see what you can build. 2018-19 Game Dated Moments Week 28 Cards are Now Available on Upper Deck e-Pack®! 2018-19 Game Dated Moments Week 27 Cards are Now Available on Upper Deck e-Pack®! Everything You Need to Know About 2018-19 MVP Hockey Pack Wars on Upper Deck e-Pack®! 2018-19 Game Dated Moments Week 23 Cards are Now Available on Upper Deck e-Pack®! Should allow the Moon Girl/Devil Dinosaur team as well so that Moon Girl isn’t all by herself.